Ants can be more than just a common pest. When they build massive piles or infest your home ants become a number one enemy to your security. Not only do ants destroy wood and other delicate surfaces they can be dangerous in large numbers. If you need to remove these pesky creatures from your home consider one of the top ant killers listed below. 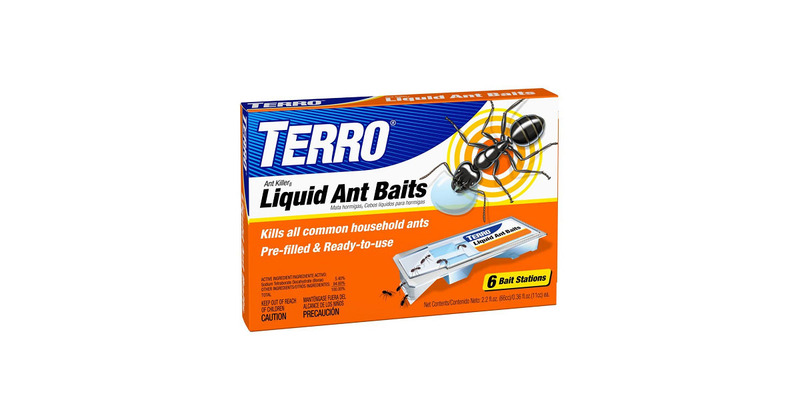 The number one winner and Gold Pick is the Ant Killer Liquid Ant Baits by TERRO. Featuring a safe design, efficient elimination and odorless makeup the Liquid Ant Baits are perfect for a variety of uses. Whether you have ants inside or outside the bait will remove any common ant and give you a clean environment again. 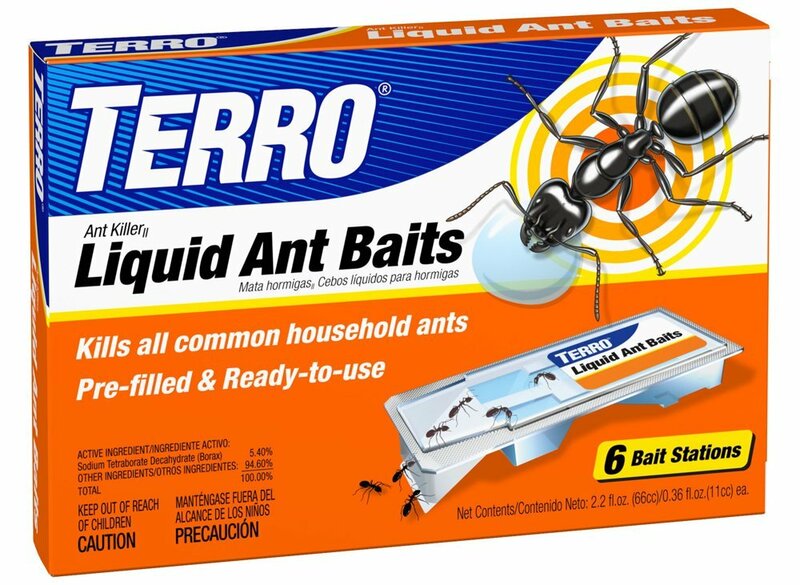 A pack of TERRO Liquid Ant Baits come with 6 baits. These can be placed in most locations where ants are found. Simply put the bait at the root of the trail and rest easy knowing that your ant problem will be taken care of. There is no extra work involved with using this product. It is easy, clean and safe. This product works by luring ants to it with a sweet scent. This attracts worker ants leading them to consume the bait. After this they return to their home where they infect others with the bait. After 2-3 days you can expect the ants to be eliminated. It works slow to ensure that all ants are taken care of. Depending on the size of the colony the bait may take longer to work. To activate this device you break the stations, cut the colored tab and put the bait station in your desired location. After that all you do is wait for the bait to take hold of the colony. For maximum effectiveness it is wise to leave it down for around two weeks. This guarantees that the colony will be dealt with. It is best not to interfere with the bait station once it has been laid out. This increases chances of success. The last thing you want is for the ants to not all die off. They will reproduce and strike back with a vengeance. Avoid this at all costs! It is common to see more ants arrive after you have placed the bait stations. This happens because worker ants are highly attracted to the scent of the liquid. The more than consume this liquid the better. Let them do their business. In due time the ants will be gone. If the station runs out of liquid bait just replace it with a new one. This happens in areas with a massive infestation. The Liquid Ant Baits is an excellent purchase because it works. It gets not easier than this device which is why it is a Gold Pick. It is easy on the environment as well which is great if you need to use it in an outdoor area. For the most effective use try rotating in new liquid bait stations every few months in areas that used to house ants. This keeps more from taking back their unlawful homes and gives you confidence that your home is safe from ant infestation happening again. This ant killer is regarded as one of the best slow killers on the market today. It is a smart choice to control the population of angry ants in and around your home. Take caution when placing it where pets might have access to the liquid bait. Be sure that no pets or small children consume the liquid. A 6-pack of this product can be found for around $6.00 at most home stores or online making it easy on the wallet. This is great if you plan to buy in bulk if you want to get the most bang for your buck. TERRO is a quality brand that is worth trying out. If you are not satisfied you have not lost much of an investment. Using this liquid bait, however, is sure to impress you, and you will more than likely find satisfaction in the results. The Silver Pick is theh Combat Source Kill Max A2. Combat is a trusted name brand that is known for its effect, high quality and innovative pest control products. The Source Kill Max is a powerful tool to use to remove ants without putting your environment in danger. Everything about the baiting tool is geared towards simplicity, and you will not find an easier applicator to use in the ant killing market. The first bonus to using Source Kill Max is that it is childproof. The device cannot be operated by your young one. It is a perfect choice if you have children that could tamper with the device. It is made for adults to use while providing a safety mechanism to prevent a child from squeezing out the chemical. The syringe makes it easy to operate and is accurate. This device is appreciated for its quick use. It is ready to go as soon as you open the box. There is no blending of dangerous chemicals or prepping involved. If you need fast ant removal this choice will keep you from getting bogged down by a complicated application system. Just aim and squeeze. 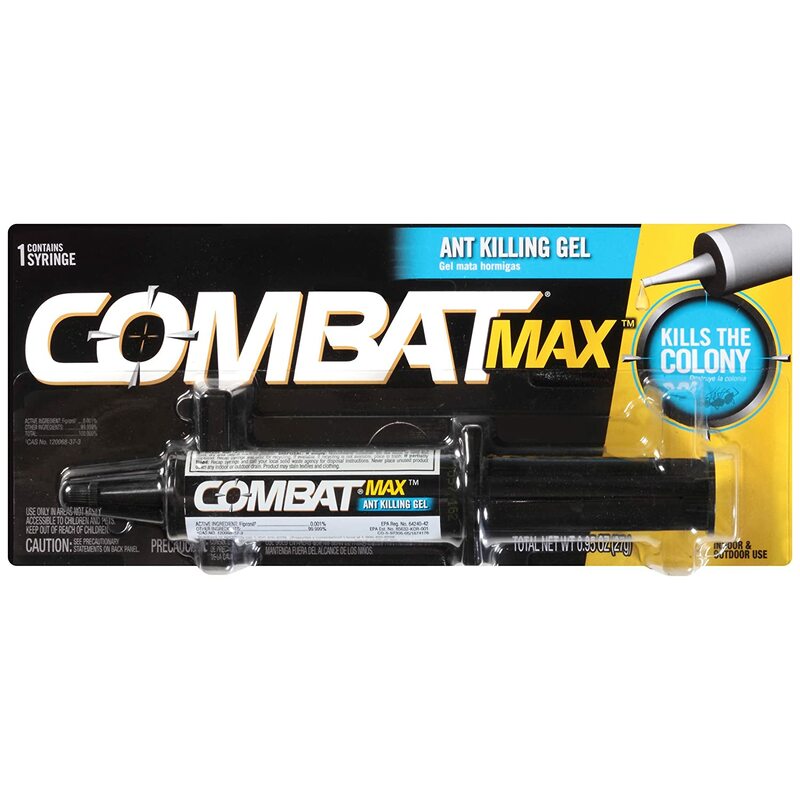 Within 3-5 days this fast acting gel will eliminate the target ants and their families from the intended area. Ants have a tendency to burrow themselves into the most inconvenient places. Due to their tiny size they can position themselves just about anywhere. Often an ant colony is not easy to find. The design of this device is of particular use if you need to put bait in hard to reach locations, cracks and other strange spots. This is something unique that might prove very useful. The sweet water will attract ants in no time. Once it is consumed the ants bring it to their colonies where others soon become contaminated. In less than a week you will see clear results. The syringe is 27 grams and has enough bait inside of it for multiple infestations. It works well whether it is used inside or outside. The gel is not destructive to the surface you place it on. You should take the usual precautions when using this product. Do not put it near food or on surfaces where food is placed. Use common sense when deciding where to apply the gel. The gel might stain your clothes as well if you are not careful. 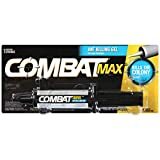 You can try out the Combat Source Kill Max A2 for just under $7.00. It is affordable, long lasting and child-safe making this a prime choice for users who have small children in their house. Read through some user reviews yourself to see why this is one of the top choices for a great ant killer. Syringe ant killers are popular on the market due to their effectiveness. Many products utilize this design. Only a few get it right. Another product that get gets its right is another gel form insecticide that makes it to the third place slot is Advion Ant Gel. Like the Combat device Advion uses a syringe design that focuses on killing any level of ant. It is strong for use against larvae, worker ants and the Queen with equal power. The syringe is easy to squeeze. It is made for quick and precise applications in a variety of areas. It will not eat at the intended surface which is great because it can be used all over indoors as well as outside. Advion Ant Gel is great for kitchen use as long as you avoid placing it on surfaces where food is prepared. You do not want to accidentally cook with traces of the poison gel. Ants might be eating it but you do not want to! It is easy to put some gel near garbage cans, cabinets, shelves, under the oven or behind a refrigerator. The syringe tip makes it easy to put behind toilets and hard to reach areas in your bathroom. If you use it in the living room be sure to tell others in your household that it is there. It is good to be cautious and respectful of others in the home. The gel is ingested by the worker ant, and like other ant killers, is brought back to the nesting grounds of the colony. Inside the colony the poison kills off the ants through contact. This reaction is spread among the entire ant population. After a few days the ants are gone and you are left with an ant-free environment again. One user said that Advion Ant Killer “work[s] better than advertised…and the ants are usually gone within a day.” It is hard to find quicker solutions at such a competitive price. You can get a pack of 4 syringes for about $25.00 depending on where you do your shopping. It is well worth it to buy this quality product in bulk. Like other gels it is recommended to keep a syringe or two as a backup in the event that more ants infest the old colonies. Chances are low but still very possible that new ants will want to take a trip to your home and try to make their vacation permanent. Having more ant killer in storage will put an abrupt stop to their holiday and return your home back to a level of safety and security. If you want a decent syringe alternative that will save you time, money and trouble in the long run then this is for you. While it is not as well reviewed as some of the others on the list it is still a much loved insect control system that guarantees almost immediate results. It is a good bargain and a solid product that is sure to control your ant problem. Sometimes you are in a bind or on a budget. You need fast results to get rid of an ant infestation that is taking over your home, and you might not want to blow loads of cash on a product that may or may not work. 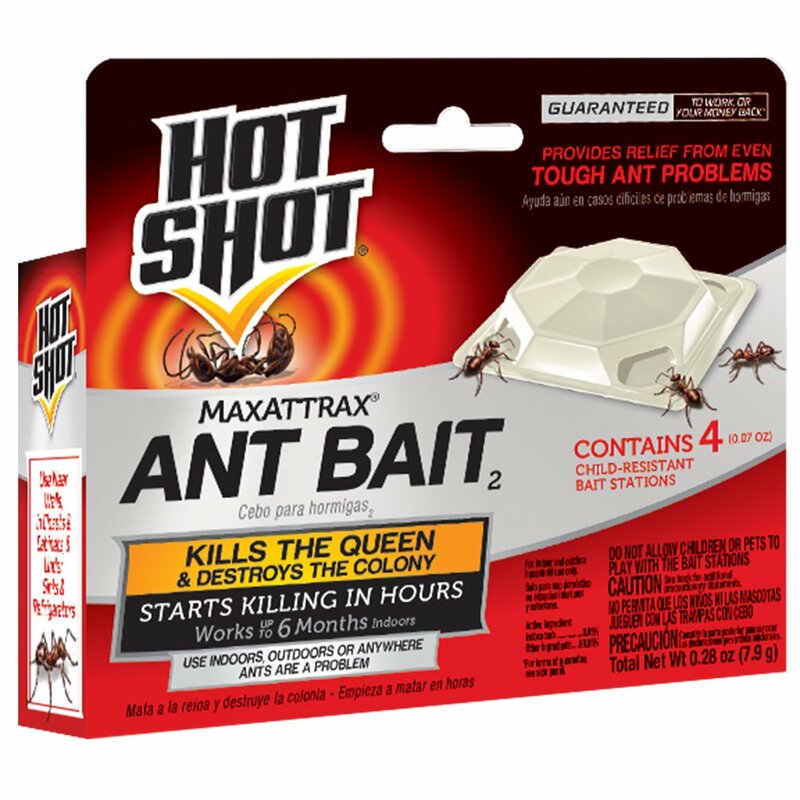 An affordable alternative to some of the more expensive devices is the 2040W MaxAttrax Ant Bait by Hot Shot. It compares well with the Gold, Silver and Bronze picks. While it might not cost as much the MaxAttrax stands firm on its own. The design of this product is a standard bait station. There are four openings that allow ants to enter. Inside of each station is the fast acting poison. This product is of a durable design and is made to last for up to 6 months with indoor use. This makes it one of the longest lasting devices in the ant killing market. You will not need to replace it for quite some time which will save money and time down the road. The MaxAttrax lures a variety of ants to the station where they are exposed to the poison. The ants return to their colonies and infect the other ants. After the poison travels through the colony it makes its way to the queen thus stopping the colony from growing. You can expect to kill off most typical household ants, pharaoh ants, cornfield ants and many others. This product is not limited to a certain species. This is something important to look for when choosing an ant removal device as you want to get the most power for the money spent. You can pick up a pack of 4 of these for under $2.00 making it the best bargain to keep Ballin’ on a Budget. If you do not enjoy how the product works simply dispose of it and move on. Your wallet will not be much lighter from testing this ant killer out. However, reviewers low the simplicity, effectiveness and build of this bait station so chances are so will you. Give it a shot and erase those bugs from your personal space. Be sure to keep the environment in mind when choosing any sort of insecticide. Some types are known to be destructive to nature and may cause harm to creatures that are not the intended recipients of the poison. Many toxic chemicals that are found in insecticides can ruin soil, pollute water sources, kill good insects and make the air less favorable. It is very important to think about where you will be using the product and how it might affect the environment around the selected area. Using certain ant killers in an area with poor ventilation could cause headaches, dizziness or worse. Other pesticides have been known to lead to cancer in humans, and that is something that you want to minimize as much as possible. Plenty of insecticides work wonders for infested areas. Some work better than others. It is smart to read up on how effective a product is before choosing to try it out. Not only will this save you money but you will not aggravate a problem. You will eliminate it. The goal of any insecticide is to remove bugs that are destroying your home. Syringe based systems work best against ants, but you will also see success in the bait station designs. Try to avoid using the wrong product. Look for products that come in packs of 3 or more. This way you get plenty of great ant killers to use immediately and in the future. If the product seems too expensive to be worth it then you can avoid it. The same can be said for products that are too cheap. Read what others are saying about the value of the product. Weigh the cost against the gains. There are enough options to choose from. You will find one that fits your needs and is of great value. A good price range would be anywhere from about $2.00 to $10.00 for highly effective, powerful and lasting ant killers. See what others are saying about what is out there and make an educated decision. Products with a focused delivery system like the syringe keep messes from being made. This is of the utmost importance. You do not want to make the mistake of spilling ant killing gel all over an area where it can be harmful to yourself or others. Bags of raw product are not good to use indoors as they are not easy to place in strategic locations. Syringes, bait stations and the like are perfect for keeping it clean because you can direct them into specific spots without any trouble. Powders are to be avoided unless dealing with massive red ant piles outside and away from your home. Ant populations in or around your home are never fun. They cause a number of issues for you and those in your household. Without proper treatment they will as unwanted guests living off of your resources. Taking the right steps to getting rid of them is something that can be done without spending too much cash. There are hundreds of amazing products for smooth elimination of ants. Research your options and go with what best fits your situation.